Vanessa Brett, The Sotheby's Directory of Silver 1600-1940, 1986, no. 559, illus. p. 150. The arms are those of Bridgeman, almost certainly for Judith Bridgeman, daughter of Sir John Bridgeman, baronet, of Castle Bromwich, Warwickshire. She married Captain Richard Corbet, who died in 1718. 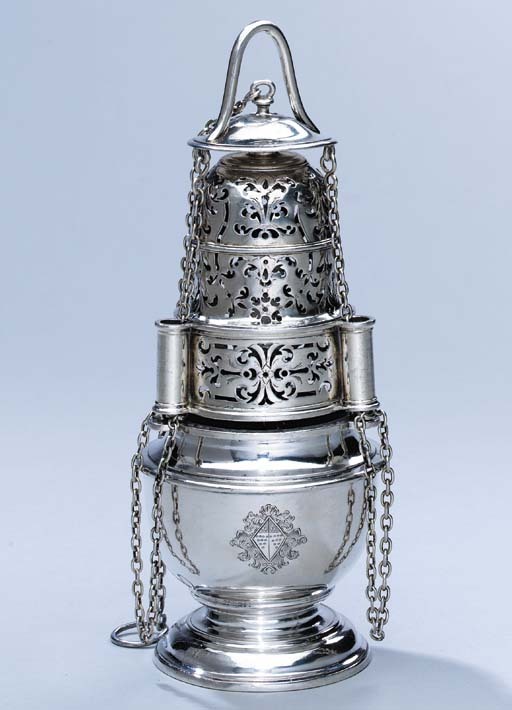 An extensive toilet service made for Judith Bridgeman in 1691, also by Anthony Nelme, was in the collection of William Randolph Hearst, sold at Christie's London, December 14, 1938, lot 67. Two of the covered bowls from the toilet service are in the Gilbert Collection at Somerset House, published in Timothy B. Schroder, The Gilbert Collection of Gold and Silver, 1988, p. 137, cat. no. 33.